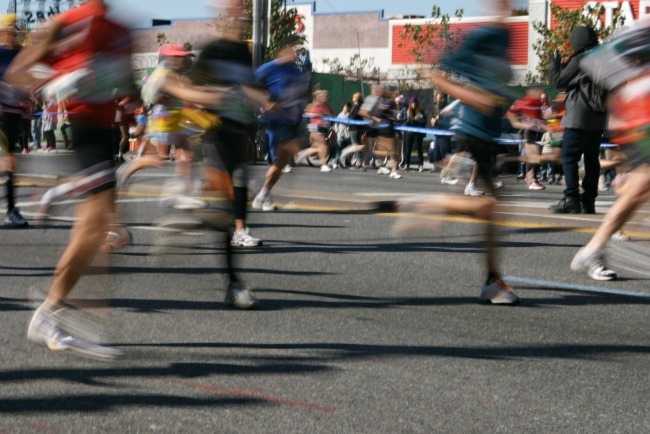 i love going to watch the marathon every year. it so exciting and such an inspiration. this year, i even had two friends running, so that made it even more special. 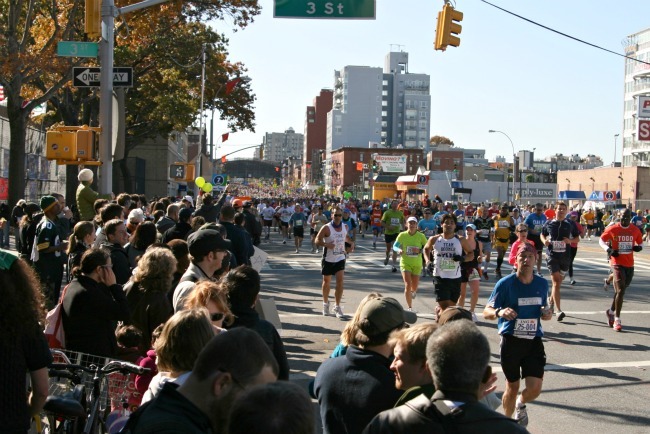 chris, holly & i met up in park slope to cheer on the runners and we had a blast. after the elite runners come through, it is so amazing to see the sea of people coming up the road. christy turlington!! too bad it's out of focus, but we totally cheered for her and she gave us a little wave and a big smile. running along with christy for every mother counts, was the one and only dooce (aka heather armstrong). chris spotted her first and we started yelling her name and cheering her on. the awesome part? she totally heard us and ran across four lanes to come and give us high fives. it was awesome!! aside from our celebrity sightings, i loved seeing all of the runners in their wacky costumes. it's hard enough to run a marathon, but to do it dressed in a sumo costume? or as a colonial patriot? crazy town. and then, there was this guy. i love japan, but even i don't get this one. 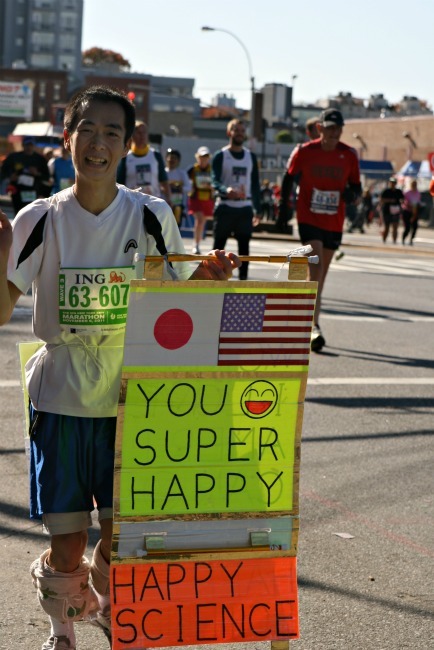 another great thing about watching the marathon in brooklyn, was seeing all the love from the runners and the crowd. it's also awesome to watch in manhattan, but there was just something special about watching among fellow brooklynites. it was so great to see so many people spot their friends and stop for hugs and high fives. and it was extra special to see my own friends along the route. stephanie claims seeing us gave her the energy to get through brooklyn and in to queens. for me, it was such a thrill and one of the very best parts of the day! i am SO proud of kat. 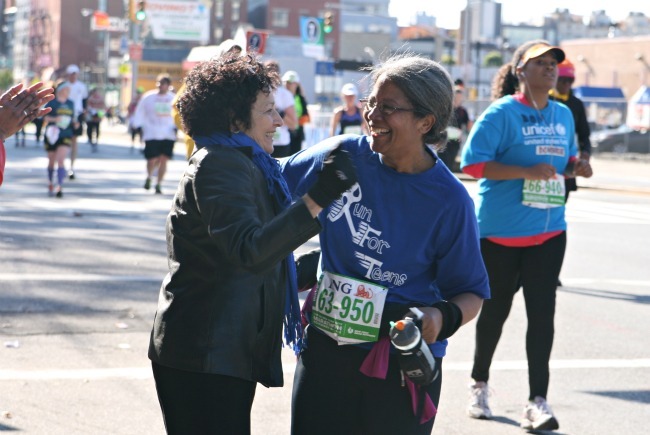 she is a fellow rhematoid arthritis sufferer, but she totally did it!! and i love that she ran with her sister and a friend. we felt so bad leaving towards the end. we all wanted to stay and cheer on every last runner! see you next year, marathon!